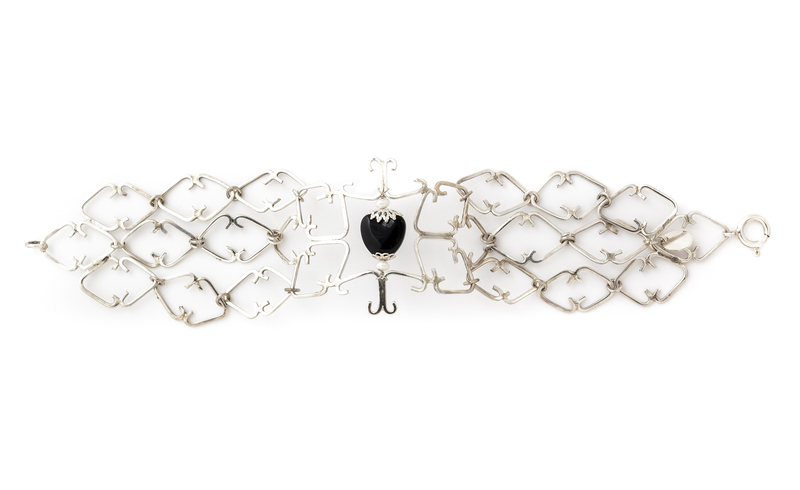 The elegant cuff bracelet with a large silver mesh structure and onyx stone, belongs to the line of jewelry called Is stellas that reinterprets in a contemporary way the traditional gancera, an element of the traditional female Sardinian garments. The modular radial pattern welcomes and emphasizes the pearl of refined taste. It is part of the line of jewelry called Is stellas that reinterprets in a contemporary way the traditional gangera, an element of the traditional woman Sardinian costume. 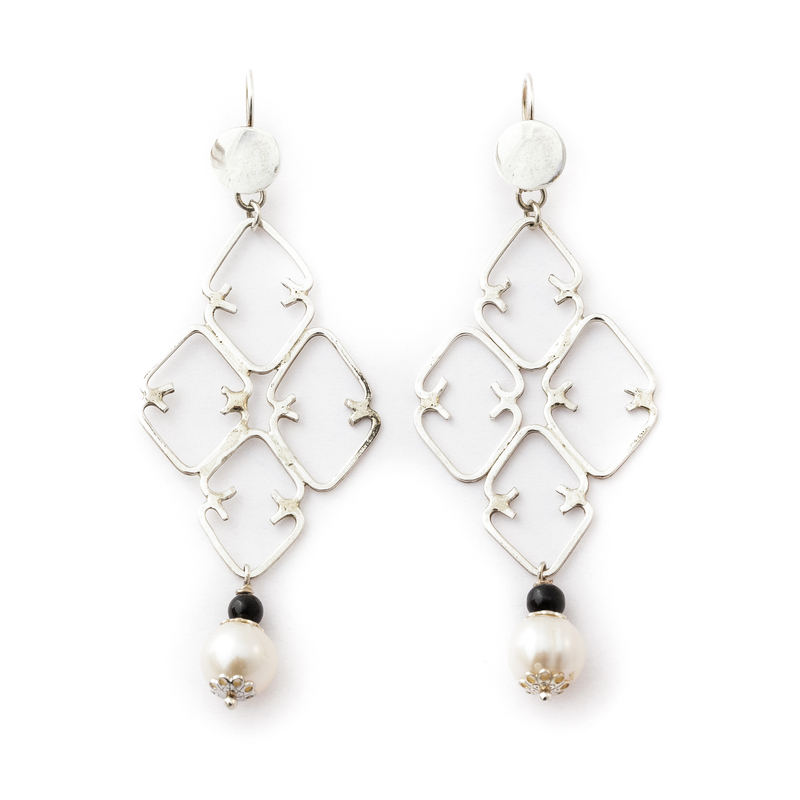 They may have the shape of a large diamond or a lightweight mesh, elegant and brilliant earrings with black onyx and pearl pendants. Precious and unique large mesh necklace with alternating pearls and onyx as the central element of the pendant. It is part of the line of jewelry that reinterprets in a contemporary way the traditional gancera, an element of the traditional woman Sardinian costume. The fine handcrafted jewelry has the value of an ancient object, carrying the initials engraved on it. It is part of the line called Is stellas that reinterprets in a contemporary way the traditional gangera mesh, an element of the traditional woman Sardinian costume. Roberto Mele has learnt the art of jewellery making at an early age from his father Giuseppe, a goldsmith and watchmaker with an eclectic personality who transferred in his workshop a suggestive family history's history, made of long journeys and compelling stories. At the workshop, he learnt the techniques of classical jewellery in addition to the traditional processes called "lost wax" and "watermark". In his creations, he freely expresses his personal artistic sensitivity, crafting a production intended to be further customized for the customer, an indispensable condition to create unique objects of affection. The workshop in Assemini is attached to the jewelry and watch shop, very well renowned also for the highly skilled family assistance for precision instruments and for the restoration of antique and modern jewelry. Roberto promotes and disseminates his work, even with striking demonstrations of his sophisticated manufacturing phases, participating in major trade exhibitions of craftsmanship and local jewellery. 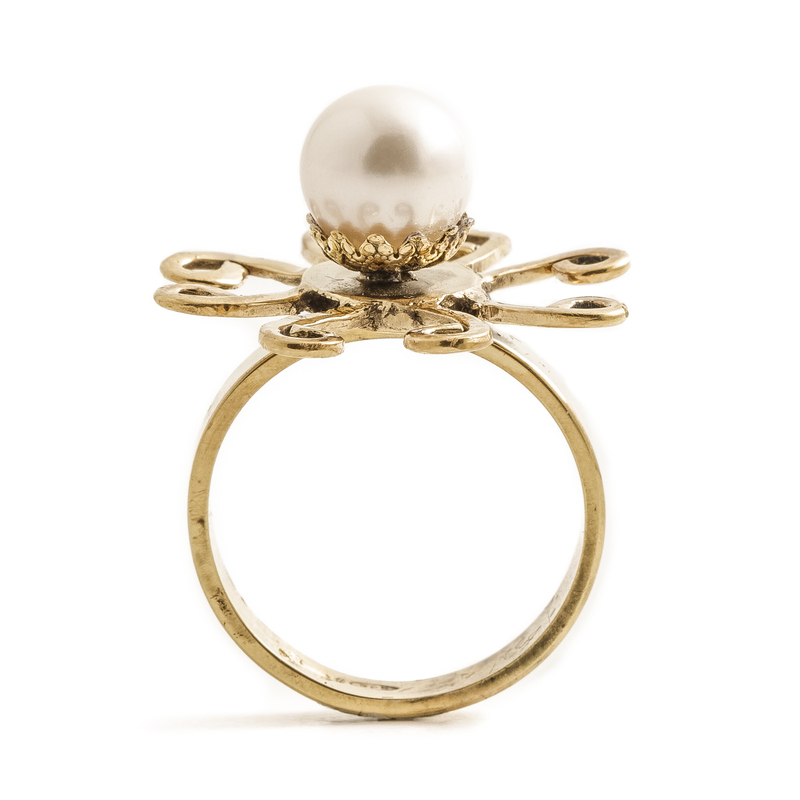 The production includes a line of exclusive creations that the goldsmith crafts reinterpreting the elements of tradition, accompanied by a line that offers the typical filigree jewelry closely linked to local traditions. The production of luxury watches is extremely peculiar, in which the artisan uses his expertise in watchmaking and goldsmithing. At the workshop, he performs classical jewellery techniques, such as the traditional filigree and the lost wax casting technique. Different techniques are used for the creation of all kinds of custom jewellery based on customized designs, with fine inclusions of stones, necklace threading, hand-, chisel- and pantograph engraving.